Even in a genre as varied as fighting games, the Soulcalibur series has maintained a distinctive personality throughout several installments thanks to its fluid, weapon-based combat. Soulcalibur VI, which landed on store shelves just last week, continues this tradition, and both pre- and post-launch tournaments have provided some of the most exciting moments in modern fighting game competition thanks to gameplay mechanics unique to the franchise. Soulcalibur VI competition started long before its October 19 release. This year’s Evolution Championship Series featured a developer-organized side tournament for the fighting game months before its official launch. Watching the main stage finals live was one of my favorite moments of my trip to Las Vegas, thanks in part to Soulcalibur legend Marie-Laure “Kayane” Norindr’s return to serious play and the overwhelming Ivy skill of champion Sean “LinkRKC” Evers. SoCal Regionals, held in Ontario, California, in September, featured an impressive run by fighting game genius Dominique “SonicFox” McLean, who defeated Soulcalibur powerhouses like Daniel “Nofacekiller” Sanchez and Tommie “Tomahawk” Williams before eventually losing a neck-and-neck grand finals to Ryan “Signia” Huculak. In the wake of those tournaments featuring high-profile players, fans were poised to take Soulcalibur VI seriously before even getting their hands on the game. The competitive scene for its predecessor, Soulcalibur V, petered out relatively soon after release, but as Kayane emphasized to Kotaku last summer, players are hoping that this iteration will have a longer competitive lifespan. Now that Soulcalibur VI available worldwide, competition has begun in earnest, and so far, it looks promising. Last night, Red Bull Gaming Sphere Tokyo played host to one of Japan’s first post-launch Soulcalibur VI events as part of their weekly Fighting Tuesday tournament series. While the entire bracket showed just how much competitors have learned in just a week, the grand finals in particular included two particularly illuminating moments that showcase just how intense Soulcalibur VI competition can get. After the elimination of 39 attendees, the Soulcalibur VI grand finals came down to two competitors: Sawazuma, a strong Maxi player from the days of Soulcalibur V, and Sunkro, whose Xianghua made top 8 at the high-profile Battle Prologue in Nakano event held in the same Red Bull venue earlier this month. Neither player had faced much of a challenge up to that point, defeating most of their other opponents by a score of 2-0. Their championship match definitely provided some fireworks. Sunkro set the pace early on with a pair of dominating rounds. The first saw the Xianghua player bait Sawazuma into using Maxi’s Critical Edge (Soulcalibur VI’s version of a super attack). He waited for it to whiff, and then punished his opponent with his own Critical Edge. As the commentators noted, Sunkro could have closed out the round with a simple combo, but instead chose to make a statement. Right after that, Sunkro absolutely mauled Sawazuma and scored a perfect round to close out the first game. But Sawazuma wasn’t ready to give up. His solid Maxi play earned him two quick rounds in the second game, and he was able to stave off a comeback by Sunkro to take a third, tying up the game count at one win apiece. With momentum on both sides, Sawazuma and Sunkro entered the last grand finals game. In the second round of the third game, Sunkro found himself on the wrong end of a sizable life deficit. With the time on the clock counting down, the commentary team pleaded with Sawazuma to simply run away; his higher health bar would’ve let him win the round, so long as he could wait out the clock. But Sunkro ensured that wasn’t an option through the use of a technique new to Soulcalibur VI. Soul Charge, a special state that strengthens characters and gives them access to new moves, has a secondary effect of freezing the timer when activated. This stopped the round clock with just three seconds left, giving Sunkro the few additional moments he needed to win another round. And what would a Soulcalibur match be without ring outs? Although every stage is different, most have areas where players can knock opponents off a cliff or into water, instantly winning a round no matter how much health the fallen player had left. This means that, in addition to watching their spacing and meter, players also need to pay attention to where they are in the stage and make sure they don’t put themselves in a position to be thrown into the abyss. Sawazuma came face-to-face with this possibility when Sunkro dodged a final launcher and put his foe dangerously close to the edge of the stage. 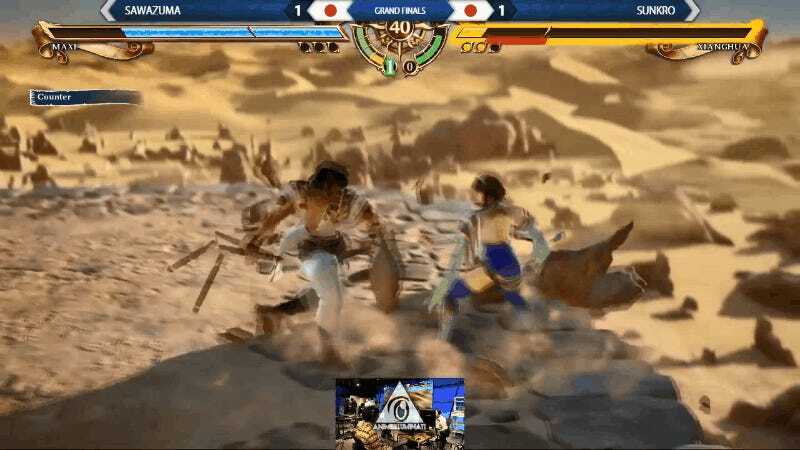 From there, all Sunkro needed to do was land his own launching attack and kick Sawazuma over, cementing his grand finals win in the most Soulcalibur way possible. It’s still too early to label Soulcalibur VI a failure or a success as a competitive title. Fighting game competition is fluid, and future discoveries could make this game anything from a laughing stock in the community to a main game at the next Evo. The one thing that is certain, however, is that the latest Soulcalibur is already providing compelling gameplay for spectators, its unique mechanics setting it apart from the rest of the genre. If the Soulcalibur VI scene can continue producing tournament moments on par with Evo, SoCal Regionals, and Fighting Tuesday, I’ll do my best to set aside time and watch.